Looking at where I am now, in Torah u'mitzvos, compared to where I want to be, I find myself disappointed that I haven't done more to honor Levi's memory. All of that brings to mind the great love that Levi had for everyone, to the point he knew where and when to use the whip that he kept in his back pocket. The last time I saw him was on Sukkos, at the shul, where he was attending the Sukkos party for the Hebrew School. He'd obviously started another round of chemo, and was fighting hard. But he took the time to look me in the eye, and say, "I'm really disappointed that you're not coming to shul more than you do. I'm disappointed that you're not learning. I met your first chavrusa from JNet, and said that you were doing a good job. So, where have you been?" Another time, earlier, before we found out that he was ill, a friend and fellow member of the congregation was in shul with his son. The son has, as we all pray for, achieved more than his father in learning, and so spoke to refute something that his father said. Levi waited until almost all had gone home, and then he turned to the boy, and quietly but forcefully said, "It doesn't matter how much you've learned, it doesn't matter what your achievements are, I don't EVER want to hear you contradicting your father in public. You know Torah, but you have to work on your derech eretz to make you into a good Jew." I'm honored that he was able to yell at me. I miss having that. Beis Medrash Promo from zeldy eber on Vimeo. One first and foremost remembers Levi’s genuineness. As “an outsider” to Crown Heights, the one family which to me stands, or stood out, as the most decent, down to earth, mentshlich, Chassidish, i.e. all the qualities one aught to have, is the Deitcsh family. I was a class older then Levi, so did not have much to do with him personally, but as mentioned, his genuineness, endearing smile and simple mentshlichkeit tears my heart out, that so precious a person was tragically taken far to early. My only comfort is, that I am sure with such genuineness and goodness, he achieved miracles – of which you know far more than I – in his all to short life span by our standards. May his wife and children be comforted amongst all mourners and may we merit Vehikitzu Vraninu Shoichnie Afar Vhu Bsoicham! I recall how how you loved all the children in and at the Shul. A little tap on the shoulder, but of course you already know. Young " G ", now 13, is set to click off this Rosh Chodesh. The words of the Torah transcend. He reads them in honor of his memory of you. Do me a favor if you will. Give his mother, when you see her, a Mozel Tov for me. May you both flourish brighter and larger than ever. On Thursday night Ohr Le'6 Kislev a gathering to mark the 1st - and hopefully last - Yahrtzeit of Rabbi Levi Deitsch, Shliach to Tysons Corner, VA will be held at The Bais Medrash - 580 Crown St. at 8:30pm. Last year I wrote and article about Rabbi Levi, OBM, He and his wife unknowingly left a big impression on me and my search for truth. 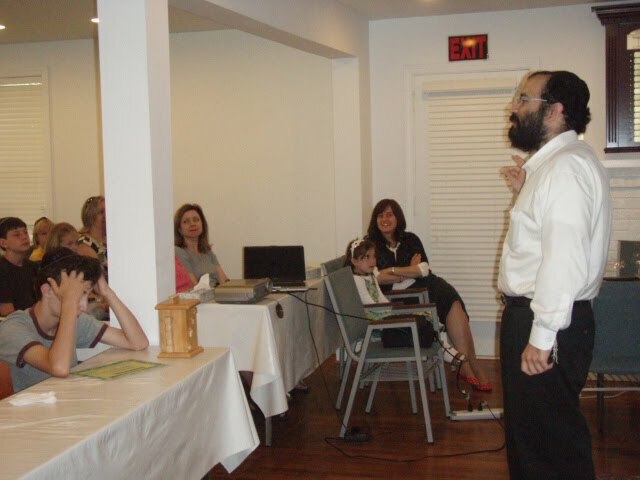 Their Shlichus helped me tremendously in staying connected to Torah and mitzvoth. You see, I moved to Crown Heights to become observant and shortly thereafter I became unable to move. I had plans to go to Machon Chana and learn Torah but instead I spent the whole year in bed unable to move. I questioned why would Hashem do this to me? Since Levi’s passing, there isn't a day that goes by that I don't reflect on his life. Judaism and Shlichus serving Hashem being a soldier for the Rebbe, being a mentch with good midos first---has become much clearer to me. Every day I take a deeper look at his Shluchis, his life with Miriam and their children and grow great strength, B”H. Levi’s shlichus has become my spiritual barometer. Memories of his family life and role as a Shaliach reinforce my desire to grow spiritually. I only was with them in their home all but a few times but I was quick to observe and take a permanent snapshot of Miriam's role as a wonderful Tznusdik thoughtful and Aidel wife and mother and Levi was the mirror of that image as father, husband, son and Shliach (the only roles I saw him in). As his passing is creeping up on a year I am making a Hachlata to remember him and in his merit continue to explore finding ways to honor him. This Saturday night Levi, I hope you are not offended, Chas V'shalom, or any of your family members, we are undertaking introducing the Rebbe's chassidim to the possibility of a cure to disease. It is true people have been cured and if it means that it might offend some, I think you would have said, " go for it," that's just the type of person you are. So, in your honor and I have so much kovod for the warrior you were and are, were going to hopefully enlighten some people and maybe help save some lives. I'll hopefully have the courage to address you there and relay to those that didn't know you how truly remarkable your shlichus was and still is to me and my world (which now, B"H, includes our miracle baby Yisroel Zvi Hirsch. I wrote on the blog but this is really a letter to you, Levi, as I know you are very much alive in spirit bc you have been guiding me. It was a tough year for us all. I pray that Hashem continue to give your wife and children unlimited strength, see you soon with the coming of Moshiach, Now! signature phrasing. I realize he has turned me around again even now, especially now from the inside out. I look up, smiling. B"H"
When I came to Chabad, I seemed "barely Jewish" to me. Non-observant and unfamiliar with Jewish principles, and negative about religion and Jewishness. Levi drew me in with his warmth, humor, generosity and great acceptance. I felt I could be who I was and supported but never pushed. Over time, through watching Levi and Miriam, I came to like, respect, and love Judiasm. I loved how Levi was willing to be "flexible" with interpreting the "Observance of laws". Had he judged or pushed, I probably would have written this whole beautiful way of life off. I am so grateful I haven't. My 14 year old son, Zack came to me last night and said non-challantly, I think I am going to stop eating pork (and in memory of Levi.) I had stopped eating pork and shellfish last month in memory of Levi. And it has brought surprising gifts with it. My 11 year old son Jake remembers Levi's story about the two chickens and cows and other barn animals brought into the house. He asks about golden calves and Joseph and Moses...through listening to Levi and learning at the Hebrew school Levi and Miriam created. So much to say. My whole family loved Levi and still do. We will keep talking about him, remembering him, and being influenced by him. May G-d Bless. Tracht gut vet zein gut was his motto until the very end. Please forgive me for posting this long time overdue. It was my intention, since that very sad Motzaei Shabbos, to write to you. I did start writing several times, but found it painfully difficult. There were no words to pen down the many thoughts, emotions and feelings. So I tried to ignore my emotions and focus on some memories. Much of what I’m writing is surely known to you, as you knew Levi much better than anyone else. Nevertheless, I would like to share some of my personal experiences with Levi and tell you again how much he meant to me. I first met Levi in the middle of 5752 after moving to Crown Heights from Israel, in order to start learning in Oholei Torah. I was a shy Israeli boy, who had just lost his mother, and was trying to get used to my new life, new friends and a new environment. I had great relatives and grandparents in Crown Heights who were an amazing support but it was Levi who was that extra support amongst the friends, who made the entire process easier. Levi was an open and loud boy who knew everybody and was the anything but shy. Levi was life. He was full of Chayus. He was always in a good mood. He enjoyed life, his family and friends. I will forever owe Levi so much for helping me adjust and melt in. As we were entering Shiur Alef Zal we decided to become Chavrusos for Chasidus, and we kept it up until the end of yeshivah, four years later. We spent hours and hours learning, shmozzing, farbrenging and just hanging out both in Yeshivah and at home or in 770. 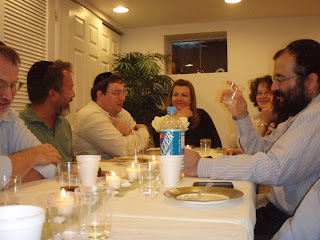 Often we would continue after night Seder to Levi’s home as Levi loved having friends over at all times of the day and night. You never felt that you were bothering anyone. There was always something to eat and drink, and if you were tired, even a bed. So much has been written about the amazing Hachnasas Orchim and special Shabbos meals at your home. There was always room for another guest, and everyone felt like they were part of the family. No matter what part of the meal you showed up you felt like the most welcomed guest. I had the privilege of being Levi’s partner for several summers, mostly in CGI Montreal. Levi was an amazing counselor who cared for his campers’ every need. If a camper wanted to leave after one month Levi found the way of making sure he would stay for both. If a camper was feeling bad, Levi found the way of making him feel special. When Levi was around everything was fun, even a simple hike. There was always something exciting. He would sing, crack jokes, motivate and encourage. He knew how to give everyone around him the attention they needed and always had a good word for everyone. Levis energy and lebedikeit was contagious, bringing an unbelievable summer experience to his campers and surrounding. After each meal he would start to sing, even if the head-counselor would ask for quiet. Nobody could get angry at him, you just smiled and sang along. With Levi around it is no wonder we always won bunk competition. Levi loved the Rebbe and would make sure to infuse his campers with feelings of Hiskashrus and Chassidishkeit. Story time at bedtime, midnight activities and just hanging around were all ways of motivating and inspiring the young boys. We spent two consecutive summers with the same bunk and formed a special and close relationship with our campers. Levi would organize Farbrengens and activities for our campers throughout the year. We went on Mivtzoim together, had Melave Malkas and much more. Levi lived camp year round. At the camp reunions he was the natural central figure. When our third summer together came around Levi had a revolutionary idea. Being a waiter in camp was not the most prestige-filled summer job and it wasn't something an average Chasidishe Bochur was looking to do. Levi, with his unbelievable compelling talent, got a wonderful group of great Chassidishe Bochurim to come and serve as waiters (or Mashbak”s as we called them). Although formally I was the learning teacher and Levi the counselor we ended up doing everything together and we had a wonderful summer, spending lots of time learning and Farbrenging, but also going on many trips that Levi managed to arrange for the group. In my humble opinion it was an amazing accomplishment that contributed to a much stronger chassidishe environment in the entire camp from then onwards. Our forth summer we spent in the European summer Yeshivah in Italy and France. We traveled a lot and had a great time. Levi spent much time during the pre-summer months on getting good boys to come along, thus ensuring it will be a truly Chassidishe experience for all. Our fifth summer together was back in Montreal. Levi was head-counselor and I was learning-director. What I miss most of that summer is those Shabbes afternoon Farbrengens in our little condo. 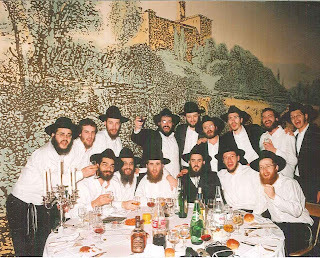 These were truly special moments, talking about anything and everything over a Lchaim or two, getting ready for our lives as Shluchim of the Rebbe. During the Shivah I took out the many albums I have with thousands of great summer pictures. Loads of wonderful memories of unforgettable moments that will be cherished for life came rushing in front of my eyes. I was just sitting and crying while staring at Levi being Levi. Here he is laughing, smiling, dancing, sporting, learning, farbrenging and just enjoying camp like only Levi knew. I will IYH scan some of them and post them on the blog. I will forever be thankful to Levi that he allowed me to be part of those wonderful days. This week I learned an important lesson about friendship. One of my closest friends and classmates, Rabbi Levi Deitsch of Chabad of Tysons in Virginia, passed away last Shabbat after a three-year battle with cancer. Levi was a true friend who’ve I spent lots of time with in Yeshivah, summer camps and travelling. I will always be thankful for getting to know him and being able to learn from his many qualities. I will truly miss him. But what inspired me most about Levi, during his life but especially the last week reading so many emails and blog posts, was the fact that there were literally hundredths of people that considered Levi one of their best friends. He had an amazing ability of giving all he came in contact with the feeling that he was their best friend, that he really cared for them and that you can always count on him. Everyone was just happier when Levi was around. And it wasn’t a show, it was just who he was: a true friend, who cared for so many, with his entire being. Levi was a living example who demonstrated that love and friendship are not limited. We can befriend many more people then we think. Let us not hesitate to reach out and acquire another friend. No one has ever suffered from having too many friends. There is so much that can be written about Levis amazing friendship quality. But for me the most amazing thing was that Levi was able to connect with anybody, young and old, far and near, he was simply everyone’s best friend. For real. I remember a period in yeshivah where Levis was trying to surprise his friends on their birthdays. Not only was the present itself a surprise but also the way he handed it over. At one occasion he found an old kindergarten picture with one friend. He enlarged the picture to a 20x30 poster and framed it. He then sneaked in to the friend’s bedroom at home and hung it up at the wall over his bed. As far as I remember he didn't even ask for permission. When Levi wanted to do something, he just did it. With his laugh and a good word, you just accepted it with a smile. What else could you do? At another occasion he purchased a leather Siddur, personalized it with a friends name and hid it in his Tefilin bag so he will find it the morning of his birthday. These were small things and thoughts that made Levi so loved by all his friends. Naturally, after leaving to Shlichus we were less in touch as there were time differences etc. but we kept in touch and would speak every so often. What amazed me most was Levis ability of remembering details of names and people. He would ask how this and this is doing and how did a certain program develop. It could have been months later, but he remembered it all. In general Levi felt very close to Stockholm, as he was a great-grandson of Rabbi Yaakov Israel Zuber who served as a Rabbi and Moehl in Stockholm during the 1930’s and 40’s. Rabbi Zuber was a Rabbi in Adat Israel Shul, where I Daven today. Levi was very interested to know how is “Zeides Shul” is doing and would ask about as much details as possible. After Levi’s father, Reb Zalman, passed away we decided to start a phone Shiur on Thursday night / Friday morning where we learned together a sicha bechavrusa. The first year or so we learned together but after a while some classmates joined and this kept for several years. The Shiur was very dear to Levi and he would make an effort to join, even when he was already sick and it was getting more difficult. Unfortunately due to Levi’s condition the Shiur weakened the last period. But Levi promised me several times that as soon as he gets better he will join again. Now his friends have decided to renew the Shiur, and it resumed during Shivah. Every Leil Shishi friends from around the world join in learning in his memory and I’m sure Levi is joining us too from Gan Eden. (If any of Levis classmates are reading this and would like to join please email me at rabbi@chabadstockholm.com for the details). I saw Levi last during the Kinus Hashluchim, in NIH hospital, just over a week before he returned his purified soul to Hashem. It was very obvious that his condition was not good. Nevertheless he made an effort to joke around and talk about whatever as if all is well. Tracht gut vet zein gut was his motto until the very end. Levi, I will forever remember you for all the love, friendship and happiness you spread around you. Your amazing ability to think positive will be a motivation and inspiration for me. Often, when things are difficult and I have a hard day, I think of you and get encouraged to keep it up. You will forever remain with us. Soon, Moshicah will come and we will be able to continue our Farbrengens together. Until then, may Hashem give your wife, children, mother and siblings the Koach they need to go on with life. Often, when such events happen we say Life must go on. Levi, YOUR LIFE must go on, the amazing of a person you were must live within all of us and continue be an inspiration for all who knew you during your short, but so accomplished, life. May we share only Simchos and Besuros Tovos with the Deitsch family from now on, Simchos that we will all share in. I can not stop thinking about him. Great man and a real Rabbi (The only one that I trusted). He will always be remembered by me for his love, patience, kindness, sacrifice and generosity. He was always there for me helping to get my life straight. By all means ( buying my undergrad books (now 3rd year medical student), bringing food when I was sick to going out playing pool to cheer me up and talking about life. His laugh, jokes, hugs and kisses. As I write this tears are running down my face there is so much to say. Your efforts will not be forgotten. And I will keep my promise ! Rabbi Levi Deitsch. Where could a person begin? …Just about 20 years ago, one Friday afternoon before Shabbat, I heard the bell of my office door ring and on the other side were two Frum young men, holding a Talit bag and asking my father, brother and me if we would like to partake in the mitzvah of putting on Teffilin. Obviously, I welcomed them in and that was where the start of our beautiful 20 year relationship began. I witnessed him grown from a special young man to a community leader who was beyond his years in wisdom. His teachings were always filled with knowledge and the pearls of Torah which he bestowed upon his listeners, were always rich in depth and meaning. On one particular occasion, I remember Rav Levi visiting me at work and announcing that he was engaged to the woman he hopes to spend the rest of his life with, (the fabulous Rebbenzin Miriam whom we all know so well). That day we had a memorable lechaim and his face was nothing short of glowing. He was clearly radiating a heavenly joy and he was beyond happy to finally start his life with this very special woman. Months later, Rav Levi approached me with Rebbenzin Mirriam, and mentioned he wanted to start a Shul in Virginia. At the time I had no idea that a young man of his age was capable of achieving precisely that and truly, so much more. Because of his charisma and inborn love of Hashem, it seemed as if he could do truly anything. He called me and confidently proclaimed “We did it.” Albeit he was proud (and deservingly so,) his strength in being an anav overcame his desire to boast this wonderful achievement. Baruch Hashem, throughout the years I knew Rav Levi, we shared happiness in numerous other smachot as well; my son’s Bar Mitzvah, the earning of his Rabbanut, and the birth of his adorable children, in addition to many other milestones of his life. Sadly, we also shared a common displeasure in many unfortunate moments. Throughout the ups and downs, Rav Levi still carried his famous smile on his face and approached all issues of life with a positive attitude. Even in his later days, where I was privileged to visit him at his mother’s home in Crown Heights, he welcomed me with that distinct smile that made him nothing short of legendary. Throughout our time together, his Emunah in Hashem, his love of humanity and his outstanding character, never faltered. It was precisely these virtues that carried him so long and helped him overcome all of the obstacles throughout his 34 year journey in this world. Not too many people could achieve what Rav Levi did in such a short amount of time. Rav Levi will forever live in our memories and hearts as a unique person with unmatchable courage and love. Personally, I am forever grateful for the way Rav Levi touched my soul, and for having taught me to better embrace the Torah and thus become a greater citizen of Hashem’s world. Rabbi, we will never forget you. “Rabbi Levi” as he was fondly called, was sent to Tyson's Corner, VA to save lives, spiritually primarily, but in his final moments and then beyond, an actual life. In his last weeks, Rabbi Levi was in massive pain, his illness rapidly becoming too difficult for his doctors to treat. An energy healer was flown in from Israel, one who they hoped would provide Rabbi Levi with some relief. Taking a walk that fateful Shabbat afternoon, the Healer began to experience chest pains. Mentioning this to Dr. I, he was told to stay in town until Monday when he could have it checked out by Dr. B right there at Reston Hospital. Monday morning came, and as he was staying at our home, I drove him to his appointment. Figuring I’d go and say a quick hello to Dr. B. I accompanied him instead of driving to the office. It was a good thing I did, as the receptionist said he had no appointment. Reluctant to stay until the afternoon only to get a consultation, as the receptionist suggested, he says to me “Let’s go, I have friends in Baltimore, and then some things to do in NY, I’ll take care of it some other time”. Leaving the office, I glanced at the wall where the names of the doctors whose practice it was are prominently emblazed; I recognized one of them as a student at our current JLI course on Medical Ethics. Calling Dr. Y. on his cell phone he graciously agreed to have him squeezed in immediately. 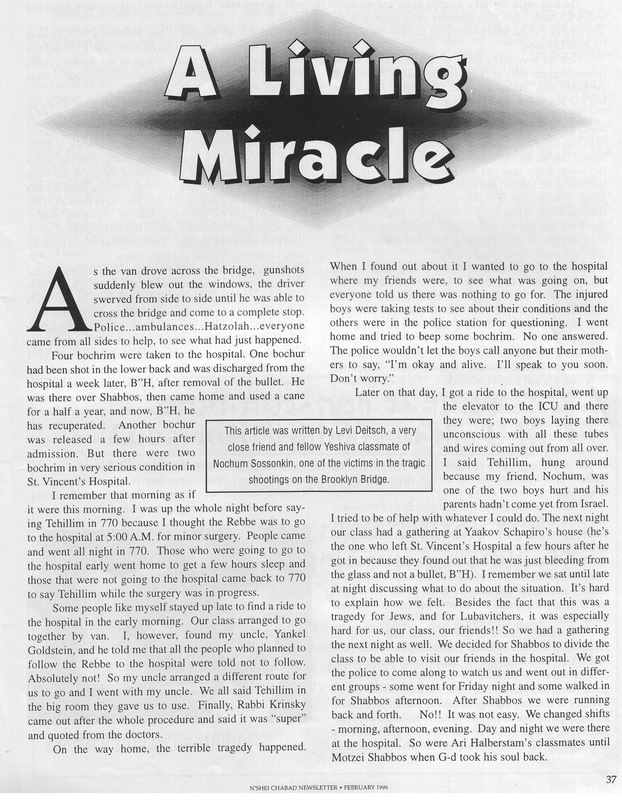 The next morning he was being wheeled into Inova Fairfax for an emergency angioplasty. His results? The opening of his coronary artery that had become 95% blocked. He was, in the doctors’ words, “a heart attack in waiting”. You see, he came to save Rabbi Levi’s life; it was Rabbi Levi who saved his. Rabbi Levi will be sorely missed. He was a larger than life figure; his presence filled any room he was in. His absence now leaves a gaping hole in our collective heart. Yet in Beit Shemesh in the land of Israel, a grateful father, husband, and grandfather feels his presence still. So does his family. When I was about six years old, he was the head counselor of Lubavitch Day Camp, the camp I went to (my father was the director). One day I won a raffle. I went up to the stage to collect my prize. He started singing that I cannot get my prize until I make a Somersault across the stage in front of the camp. I was mortified, but did it anyway. Levi started screaming and clapping like only Levi could. Of course I walked away feeling good that your uncle cheers you on in front of the whole camp. We went a few times during our summer vacations to Virginia to visit. Levi was so excited that we were coming, he went to Costco and stocked up on food for six weeks and enough pillows, blankets and towels for an army. The Deitsch's have a pool, and the Bernsteins loved using it! Levi would laugh at us that we would rather be swimming than going to Washington DC to see the sights! One time he convinced me to dive into the pool off of someone's head! The he came up from behind and pushed us both off the diving board. He laughed like only he could. We had so much fun with him! He loved his Shlichus, and made sure to be the first one in Shul. We were really impressed- as yeshiva boys, who only get up when they are forced... this was impressive! Hopefully he will inspire us to live Besimcha Uvetuv Leivav. When I think of my nephew Levi, I always remember one particular story that epitomized the reaction he had on people. The Deitsch family hosted a youth group leader for several years when he would bring his teens for a Shabbos in Crown Heights. The group would eat with one family on Friday night, somewhere else for lunch but the leader always brought the group back to the Deitsch home for Havdala. My family and I stayed at the Deitsch's house a few years during that same Shabbaton weekend and met the youth group leader and some of his students. One year, the leader arrived at the Deitsch home with around twenty teenagers before Havdala time and they milled around in the living room waiting until my brother-in-law a"h would return from shul. One by one, the three older Deitsch boys filtered in and when they noticed the group in the living room, smiled and retreated. My sister suggested that they go in and interact with the guests. They walked in and after saying hello, an uncomfortable silence settled in the room. After a moment or two, one turned to the other and said "I wish Levi was here". At this time, Levi was several years younger than the guests, but that did not matter, he was the one who would have engaged the group and broken the awkward moment. Levi, now we are also turning to each other with the same bakasha: "I wish Levi was here", not to break any uncomfortable silence or to put strangers at ease, but to enjoy your warm personality and shining demeanor, to see your obvious love for your famliy and for your shlichus, you will always be an inspiration. I wish Levi was here. I just watched the video on Shmais couldn’t stop crying, levy last time I saw you was at Nosson’s Shiva you were there being Mechazek us, though we were class mates (from the original 22) we hadn’t really spoken for some years before then and one of the reasons for flying in was so that we can catch up an I remember thinking to myself this is was chasidim used to say: “Tzuman gegesen ober... we both ate from the same table but somehow only one grew to be a giant” seeing you after all those years you emerged so powerful so huge… Levi Teiere you always had such a good heart Daven for the class that the rest of us have the vision you had, I pray that having watched this video will make me a better parent son siblings Jew and Chasid. When the word Shliach comes to mind, there is no one that can better fit the description the Levi. He treated every Jew with kindness and made them feel like they were the most important person in his life. He himself was filled with life. Always happy no matter how sick he was. He was welcoming. You never felt like you were a burden on him. And one thing that the Rebbe stressed was to be Mesudar. I cannot think back to one time where Levi did not present himself in a neat and dignified way. He was a true Chossid. Always inspiring others to do more. It’s impossible to think about the future without you here physically helping and encouraging us. It is hard to move on. But we all know that the best way to keep your flame alive is by continuing to spread Yiddishkeit to others and strengthening ourselves one mitzvah at a time. Levi we miss you very much and we Daven every day for the coming of mashiach when we can once again be reunited with our dear Rabbi Levi. By taking on one mitzvah at a time we are hastening the coming of mashiach, I will work on strengthening my ahavas yisroel-love for you fellow jew, in Levis merit and I encourage you to take on your own mitzvah. honest, over the past two years, I came to love Levi Deitsch. how we came to embark on a very special life journey together. appointment and met with him at his small office at the Shul. incredible Lubavitch culture—their way-of-life and their values. experienced has been enriching beyond words. Shiva in Crown Heights for his Brother Nosson. shifts all night at his bedside. the Matriarchs: Sarah, Rebeccah and Leah. the second holiest site in Judaism. rounds decades ago when Rabbi Levi was a young Yeshiva bocher. as justification to break the sanctity of Shabbos. National Jewish Retreat in Reston a few months ago on Shabbos. to run and run like you never ran before”. I remember first arriving in Virginia, first walking into your house and feeling immediately comfortable. In general, it usually takes me a while to warm up to new people but you and Miriam were so friendly and welcoming I felt instantly at home. Two days later I was telling my mother how I was comfortable enough already to walk into the house and open the fridge and her saying how you guys must be amazing people. I assured her that you were. For the ten months that I was living in your home, I watched as you transformed so many people who came to the Chabad House. The change and growth that I witnessed was amazing and no one else could have pulled it off. Aside for weddings, Bar Mitzvah’s, and births, I saw more Yiddishkeit in the people of Tysons. I saw people observe more Torah and Mitzvos under your persuasion and influence. Even after I moved to New York and would come visit for Shabbos or Yom Tov (happily welcomed every time no matter how you were feeling and regardless of the number of other guests you were having), I saw the community grow under your care. Each time I would return, I was amazed by what you had accomplished in the few weeks or months since my last visit. I also watched your family grow through your love. I saw Miriam smile as she made Shabbos dinner for 30 people and how she would glow when you would thank her for it. I saw Zalman first rolling over, Mirel calling herself “tights” instead of “Deitsch”, Mendel making leaf piles, and Chaya learning to read while you patiently and devotedly helped them all. Then, I think of them now and how proud you must be! At the end of my year of Shluchos, you and Miriam gave Chana Raizel and me each a chitas. You had our names written on them but I remember you handing it to us and specifically saying, “We didn’t put your last names on them!” Baruch Hashem, both of us have new last names a few years after leaving Tysons. On the topic of name change, you passed away the Shabbos of my Sheva Brachos. I had called Miriam a few weeks before to find out if you were going to be able to come because I wanted you to say a bracha under my chuppah. Even though you couldn’t make it, I know how much you wanted to be there. I also know that you waited until after my wedding to leave so that I could be happy and I want to thank you from the bottom of my heart. Levi, driving home from Midrasha shortly after you were diagnosed you told me that G-d willing, everything would be ok. I can’t even begin to imagine what was going through your head at this moment and here you were trying to reassure me. Every Friday night at the Shabbos table you would go around and ask every person to say something that inspired them that week. This tradition always used to drive me crazy! And of course, you knew this and would always skip me unless I had something particular in mind. The truth is, Levi, that you inspire me. You inspire me to pursue my goals and to think of others more. You inspire me to always think positive and to never give up. I hear you singing your favorite niggun and only hope that I can inspire people even a fraction of how much you’ve inspired everyone you’ve ever met. I miss you, Levi! Moshiach Now! This past Shabbat, I lost a very dear friend. At the young age of thirty-four, Rabbi Levi Yitzchok Deitsch, of blessed memory, passed away after a heart-wrenching three-year battle with lung cancer. Levi, as he was called, was a friend of mine from a very young age. We spent our yeshivah school years and summer camp together from elementary through Rabbinical college. 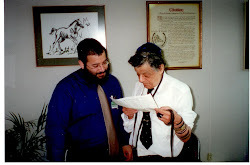 We were partners in the Rebbe's work, visiting Jews in offices and businesses on Friday afternoons: as thirteen-year-olds we would put tefillin on people twice our size and share ideas about the weekly Torah portion as if we were world-class speakers! Later, we traveled together to Chabad Houses around the world, receiving hands-on experience as young Rabbis. One of the greatest things we can do for someone who has passed away is to better our lives by learning from - and emulating - their special qualities. Levi was always happy, upbeat, and humorous, greeting everyone with a smile. He was full of life and his laughter was contagious. His positive attitude was directed to everyone, no matter what their religious standing, views, or life path. What always stuck out in my mind is not just that Levi greeted everyone with a smile, it's that he greeted everyone. We all have certain people with whom we'd rather not have to interact. Levi spoke to everyone equally for, in his world, there was no one undeserving of kindness and respect. Levi's openness and straightforwardness was another of his special qualities. He could tell everyone what he thought and felt without having to worry that he might offend them. Because of his loving, non-judgmental attitude, people appreciated his honesty. If there was a yeshivah student who cut his beard, Levi would tell him in his witty way, "Ah, com' on, you shouldn't be touching your beard; you should have a full beard." He would prod me in his forthright and loving way: "Sholom, I think it's about time for your Chabad House to be open on Shabbat!" (Levi is one of our inspirations for starting Shabbat services, which we now have every week.) People were able to accept his advice without offense because they knew that it came from his tremendous capacity to care about them. In this week's Torah portion, Yaakov prepares for a reunion with his brother Esav after many years of separation. Esav, the epitome of wickedness, hates his brother and approaches him ominously with 400 armed men. Nevertheless, when they actually meet, Esav embraces him. Yaakov is known to be the middat ha'emet, the attribute of truth. When we project and express the truth, we can even approach a person with the veneer of Esav and turn him into a friend. By recognizing and revealing the inherent good that's in every person, we can reach even those seemingly far from Judaism, through their essence. More than any other, I feel this quality personified Levi. He was able to touch so many with his honesty and genuineness; any criticism he offered was accepted as an expression of his warmth and care. If we need another reason to cry out for Moshiach to come, let it be to bring an end to all suffering and pain, when all those who have passed away will be reunited with their loved ones; and Levi will be reunited with his beautiful family, his wife Miriam and four lovely children, Chaya, Mendel, Mirul and Zalmen. And they will continue to lead the community they built as emissaries of the Rebbe in Tysons Corner, VA.
Of all the people posting messages about Rabbi Levi (Z"L) I am probably the one who knew him least yet I remain compelled to say a few words about him. I live in Montreal, Canada and was invited to play music at Mr. Michael Medina's (a prominent member of his Shul and close friend) wedding a couple of years ago and then was called back for another wedding the following summer so I've only spent to Shabbats at Tyson's Corner Chabad but in that short time, like many have already testified, a bond was immediately formed and it was as if we always knew each other. We spoke and joked like old friends and despite not seeing other for an extended period of time, picked up where we left off . Such Neshamas are really special and he leaves a tremendous void in his community that will not easily be filled . My best wishes of comfort to his wife and young children who are just as special as HE. A couple of year ago I was talking with Levi and I mentioned that I’m moving on Shlichus, I don’t recall asking him for a donation during the conversation…midway thru our talk he says B”H I’m doing well and I would like to donate one thousand dollars to help you start. Then he said, call my brother and tell that I gave you a thousand dollars and he we will do the same. That is exactly what happened, humbly and happily helping others! during this same conversation Levi was telling me that B”H he has the ability to help other Shluchim financially and he is very happy to help even though people are advising him not give “so much” Tzedaka, he said it’s the right thing to do and he is going to continue. What wonderful excitement filled our lives when you and Levi got engaged, Miriam! We were all thrilled and overjoyed that you were marrying such a fine young man from such an amazing family! What a beautiful wedding it was, one we will never forget, with all the family together. I still remember Levi singing at the wedding with such tremendous power in his voice. What passion and zest for life he had! Before you made the final decision to go on shlichus to Tysons Corner, VA, I couldn’t believe that my beautiful Australian niece was moving not far from where I was from in Maryland. Levi asked me my opinion of the move, and I was strongly encouraging. When I came for my first visit, I realized that Tysons was a very commercial area and wondered how you were going to “grow” a community there. As the months unfolded, doors seemed to open for you two, and success just flowed. From an apartment you soon found just the perfect home for running a Chabad House, shul, and guest house. Someone even renovated it and furnished it for you, for nearly nothing. People started to come, supporters, programs and events, Shabbos meals galore with many guests from all walks of life. Chabad of Tysons was here to stay! You expanded to a bigger shul nearby. You had your first weddings and babies in your own community. All while your own family, bli ayin hora, was growing so beautifully. Miriam, you and Levi were so dynamic, so giving and full of life. You were a shining example in every aspect of your life together of what a Chassidishe family represents. Needless to say, I had the highest respect for you both and the work you were doing. Our family was very proud of you and always will be. I used to visit my Mother who lived at The Hebrew Home in Rockville every year, sometimes twice a year. You welcomed me so graciously for Shabbos on these trips. My visits with you were always a highlight. Smiling and relaxed, the house spotless, the aromas from the kitchen enticing, and the children already in bed when I would arrive erev Shabbos, you made everything look so effortless. Levi would be preparing his laining, his talk for Shabbos day, his divrei Torah for Friday night. He was so knowledgeable and sincere in his Yiddishkeit. With a smile and amusing word, he would challenge me to do more and be better. His honesty was refreshing. His concern for others was genuine. Whatever the occasion called for, he was fully there emotionally and intellectually. What moved me most of all, Miriam, was the tremendous kindness you and Levi showed my dear Mother, o.b.m., over the years when she was living at the nursing home. You developed your own relationship with her, bringing the children to visit her after school, and inviting her, wheelchair-bound, to your events, and for Shabbos and Yom Tov meals at the Chabad House. I know she and Levi used to talk deeply about Hashem, about her finding meaning in her suffering (she had MS), about her love of Yiddishkeit, about life in general. She always spoke enthusiastically about her visits with you. I want to express my deep gratitude to you and Levi for your kindness to her and for all the effort you expended to make her feel important and cared for. My dearest Miriam, Levi was truly special, larger than life, gifted with a profound humanity, integrity, and strength of character. He absolutely adored you, too, and told me many times how lucky he was to have married you. You complemented each other so well, and your love, devotion, and absolute respect for one another was palpable. You were both so mature for being so young. May Hashem give you and the children and all the family comfort and blessing at this very difficult time. May Levi’s loving presence sustain and support you. And, may Levi’s passion and zest for life give you courage and strength to continue on. 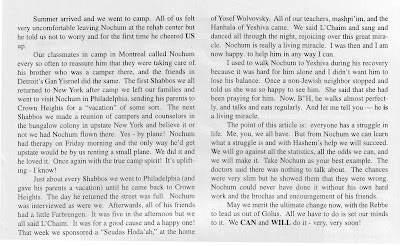 An article Levi wrote in Feb. 96 in the Nshei Chabad Newsletter. I can't begin to imagine how Levi's family, his wife and children must feel now. We have no idea. The only thing I can say is that I wish them koichos...and I wish them Levi, back by Techias Hameisim together with Nosson and his father R' Zalman A"H. I can speak for myself, and this hurts. A lot. Levi was my counselor for two summers in Gan Yisroel Montreal, 5753-54. We were kids then and barely realized it, but those were trying times in Lubavitch, to say the least, especially the summer immediately after Gimmel Tammuz. 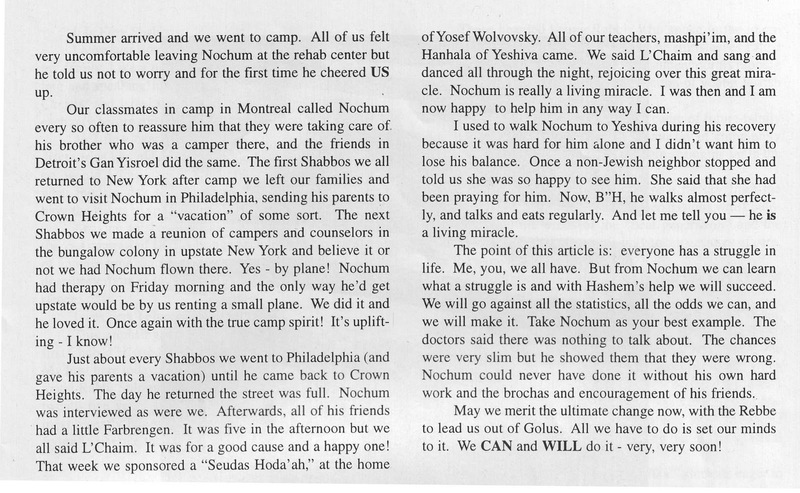 Yet Levi and his co-counselor and very good friend, Chaim Greisman, gave us more than memorable summers. Levi became my big brother in every sense of the word. I grew up as the oldest in my family, and the oldest grandchild on my mother's side. As such, I did not have a whole lot of older bochurim with whom I came into contact with on a regular basis, and did not have any role models to look up to, in that sense. Perhaps Levi sensed this; I don't know. But I do know that pretty much from the beginning, he cared for me and I could go to him with any problem I had. One of the clearest memories I have of Levi's concern for me is him taking me outside the bunk for a late night chat. The purpose? Convincing me to stay in camp for the second month, as I had originally planned on being in camp only for one month. I still remember his very convincing argument: "What are you going to do in the country? You'll ride your bike a little bit, swim in the pool a little bit, and then what? Here you have your friends, a great bunk, we're having an awesome summer, stay with us!". I did and was very happy I did. Maybe I'm being naive, but couldn't Levi have simply said to himself "the kid wants to go home, zol er fohren gezunterheit"?. But he knew that I would be better off in Gan Yisroel, and he cared enough to make the effort to get me to stay. From that early stage, I admired Levi immensely for his warmth, his chayus, his chevreman'keit - it was just great to be around him. He would tease us so lovingly and playfully, we would beg for more. He toughened us up, helped us grow out of being little boys and prepared us to be chassidishe bochurim ourselves. 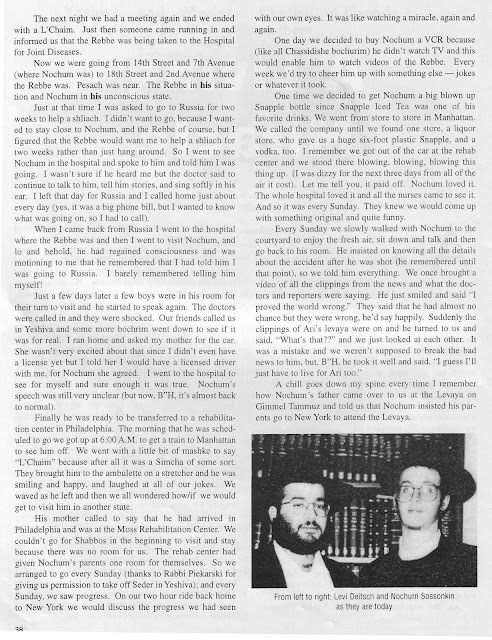 Another remarkable thing that Levi did for me was that throughout the following year (I don't recall if it was 5754 or 5755) he invited me to come to Oholei Torah on Troy Avenue, and during his supper break he would learn a Sicha with me in one of the classrooms, and force me to take notes so that I could chazzer it over at the Shabbos table. I don't remember how long it went on for, but I remember feeling so special and so loved that I was chosen to have this exclusive time with Levi, my favorite bochur. I am sure that there were many other incidents that took place during those years, but the reality is that what Levi gave me was more than something that can be measured by the retelling of specific incidents. I thought about this for a long time during my years in Yeshiva, and I truly believe that Levi was the person I modeled my own life after, and that whether consciously or subconsciously, Levi set the tone for me that m'darf zich uffiren vi a chossid. I say this despite the fact that during the years that followed, I never really was in close contact on a consistent basis with Levi again, simply because we each were in different parts of the world, at different stages of life. My heart was always connected to Levi. I give Levi credit for the fact that I am on Shlichus today. I really believe that if I hadn't had the great mazel and zechus of being in his care during those formative years of my life, I would have turned out very differently. I really can't believe that he is gone...this hurts. A lot. May the Aibishter have rachmonus on his family, on his wife and children, and bring Moshiach so that he will be reunited with them and with us all. PS IYH the next time I am in NY I will try dig up some pictures of the old times in CGI. My relationship with Levi is a bit different than most who have written thus far. I met Levi initially through his friendship with my husband Don, who was the Rabbi's close confidant and "Chief Medical Officer". As a practicing RN, I too became part of Levi's medical care team. I was blessed and honored to be invited into Levi and Miriam's "circle of trust" and worked closely with them, both in and out of the hospital, toward achieving optimal pain and symptom management. I am not Jewish. But Levi and Miriam (and their entire family) welcomed me as if I were family. I am always amazed how Illness breaks down boundaries. Perhaps that is one of the blessings lying deep within the mystery of suffering. These past few years I learned much about the beauty of Chabad and this loving family. And I hope that Levi and Miriam's lives were enriched as well through the diversity that I brought to the table. As a Hospice RN, I have witnessed many a fighter. But never, ever, have I seen the courage and fierce determination that "Team Levi" demonstrated. And I am not just talking about Levi and Miriam here... although they are legendary. The familiar phrase "it takes a village to raise a child".. in this case became, "it takes a World Wide Movement to fight Levi's cancer". Medical specialists (traditional and non-traditional) from around the world poured their collective wisdom into helping Levi and Miriam find treatments and a cure. It was staggering to witness the tireless quest and unflappable support that Levi received from "the best and the brightest"...and from family, friends and colleagues near and far. Levi, Miriam, and all of you taught my husband and I so much about the beauty of friendship; one that travels hours and hours.... and more than once.... just for a visit. You taught us much about the beauty of family as we witnessed the love and support Levi received from the countless phone calls, visits, help at home and dinners around the Shabbos table. And with deep and radiant passion, Levi and Miriam taught us by example, what love and commitment in a marriage truly is. In the heartbreak that everyone feels at this unspeakable loss, I call upon my Irish heritage and of the familiar Claddagh symbol; a heart surrounded by two hands which means "Love, Loyalty, and Friendship". Levi Deitsch was fearless and tireless in all three virtues. In our shared loss of his beautiful life, I respectfully offer the traditional toast "Today, we are all Irishmen". "May we live in peace without weeping. And may our love fill the world, angel wings tenderly beating". "Cead Mil Failte".."A Hundred Thousand Welcomes" to Levi..who rests among angels wings. As a brother (In-Law) to Levi, I am speechless, I have no words to say. In addition to the question why does the Hashem take away the best of the best people in the world, there are simply no words to describe the pain and anguish my family and I have that Levi has left us. We are left with no answers as to why this had to happen to Miriam, Chaya, Mendel, Mirel, Zalman and all Levi’s family and friends together with the whole Klal Yisroel. May Hashem bless them with much strength courage and happiness throughout their lives, they should only hear good thing from now on till the coming days of Moshiach speedily in our days. All of those who were lucky to know, meet, or hear of Levi would know that Levi symbolized many things: always loving one another, being kind to every individual, helping everyone no matter who they are, always smiling, laughing, and doing Mivtzoim, always with a passion and with love for a fellow Jew. You were always able to see how he loved life by his acts of kindness. Levi would always give, give and give with a smile on his face. I got to know Levi quite well especially over the last three to four years, whether it was by our long serious and funny conversations over the phone or from my personal visits to Tyson’s Corner over the last three years. Levi was a warm, charming, funny guy to know and to be with, and over the last three years while Levi was ill, so many people, not only America but the whole world would fly in to spend some time with Levi and it wasn’t only his friends but also respected rabbis philanthropists, family so on and so forth. They all knew that Levi was such an important person to everyone. As a fifteen year old Bochor, I always sought advice and help whether it had to do with school, friends, learning, general behavior and most importantly more personal matters. Let me tell you Levi knew it all. I always knew I could speak to Levi when I needed to. I knew I could trust him with all my personal matters. Levi was so-to-say my “Mashpia” who I always listened to and loved very much. I always thought I knew Levi until I read all the stories, poems, speeches, about Levi and his life on the blog. As well as you think you know Levi, there is always something you don’t know about him and when you find what it is you just get even more and more inspired by him. From sitting and reading all these wonderful and special stories about Levi on the blog no matter if it was his long time old friend or Shluchim around the world, or respected elder rabbis, or men, women, and children in Levis Chabad house who wrote. It brings tears to my eyes to know what a great and special bother-in- law I have and love so dearly and so much. This is a big loss for the whole Jewish community. Levi will be missed very much by everyone. But we pray that soon we will be dancing on the streets with Levi and all our loved ones and the whole Klal yisroel with Moshiach on the way to Eretz Yisroel, may it be speedily in our days. May we all take and use Levi’s lessons to our everyday life and use them will just like Levi wants us to. There is so much more I could say. I could be here for days writing about Levi and his Shlichus, funny, serious, cool, and loving stories. WE WANT MOSHIACH NOW !!! I don't have specific stories in mind. I knew Levi since I was about 8 or 9 in overnight camp. We hooked up at camp pretty much most of my summers. Then we were in Ohlei Torah together. Levi, was one of those guy's from your class that EVERYONE knew and everybody was friends with. He was a natural charmer filled with love and always smiling, not to mention always belting out some singing with his chazanish voice. He was a pillar in a group, and all his friends loved him. I used to love to stroll over to Levi's house Friday night's. He had on average by his Friday night table 30 to 50 bochurim or more. It always ended off in a farbrangen between Levi, his older brothers, and family. It was so beautiful and magical. I am trying to sum up Levi, but there really isn't many words befitting. You just had to know him to understand. Levi. I will miss you very much, may we see you very soon with Moshiach NOW!!! In the summer of 5760 I was working in the office in cgi Montreal and Levi (who was head counselor the year before) came to spend some time in camp. He was working on a project to organize the camp songs. We had a rather large room with a couch that turns into a bed, Levi stayed with us, it was great. After camp I receive a thank you card in the mail from Levi, a general thank you and the bottom he wrote: “You’ve come along way baby, keep it up”. To me that one line made the world of a difference, Levi cared and noticed the changes I’ve made, the struggles I was having and he made a point of mentioning it. That line stayed in my head, at later times he did not have to say it, I knew he was thinking it. It has been two weeks since I learned of my dear friends Levi’s passing, and it still hasn’t sunk in, and I don’t know that it ever will. I knew I wanted to write to this blog for I understand that it brings comfort to the entire Deitsch family. But I couldn’t get myself to make it real though I attended the levaya and frequented the shiva. Before I continue writing I implore all of you that find yourself often checking this blog for new material on Levi, because of your closeness to Levi, to please contribute as well, just find the time and the strength to do it – just do it for Levi for I know for a fact that it is comforting to them. One of my reasons/excuses for delaying writing is I simply didn’t know which direction I should go with this letter. So, I’m probably –certainly going to go all over the place with it, but will hopefully go full circle at the end. I grew up the next door neighbor of Levi. Though I was best friends with Levi’s older brother I’m only a year and some older than Levi – so, much fun and time was had with him as well. I mean how couldn’t I? Anyone that seemingly walked on Crown St. became Levi’s friend. I thought I knew Levi and I thought I knew Levi through and through as they say, there were nights we sat on my porch until it was light outside, we talked about anything and everything, I really thought I knew Levi, but I cannot tell you how amazed, stunned, impressed, humbled I am with Levi’s handling and “accepting” of Hashem’s way – with regards to his what many think is an unacceptable illness. When I first learned of the rumors that there may be something up/down with Levi, I called him more frequently just in case I can either infer anything or be there for him. I certainly didn’t ask him directly. When I heard for a “fact” that something not so good had been found in Levi’s chest, I painfully sat down to write an email to Levi – the kind of email that takes 30 minutes to write 3 lines. Of course I had no idea how to react or what to write, but I knew as a friend I could not just let it be and go on with my day, that’s what I’m supposed to do as a friend, something that we all know that Levi was a master at. Like 20 seconds after hitting the “send” button, I get a call from Levi: C’mon Meir, cut the trash, don’t talk to me like that. I can’t tell you how embarrassed and uncomfortable I was, I was sitting at the computer devastated about the news I just heard and Levi calls me laughing like “knock it off Meir” It’s just a Hashem thrown curve ball at him, but in the same mood like he was when he came to my backyard to play basketball. At that point I jumped on Levi’s back with optimism, hope and almost assurance that all would be well. It goes without saying how his dear wife Miriam was equally as optimistic and upbeat, though she remained as devoted and concerned to Levi’s every move. Every time I would visit Levi or speak to him, not for a moment did I feel like I was talking to a different Levi Deitsch than I used to sit on my porch until 5 in the morning with, I kept telling myself things must be under control – a person can’t be that accepting. 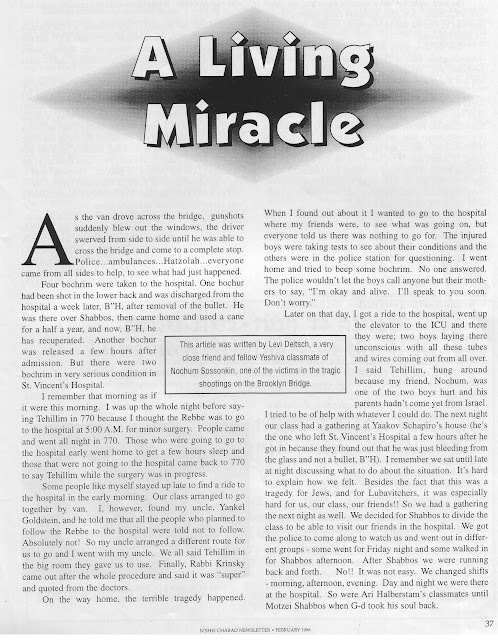 Then for me to read after his passing about all the times he was told by doctors that he has months to live!!!!! Wow, and a painful wow is all I can say! It is at this point that I would like to praise and show admiration for Levi’s dear parents Reb Zalman Yuda A’H and Tzirel (May she only know from strength, simchas and Nachas) I would often be asked by Chabad members: how is it that the Deitsch family next door to you, all of them are on track all of them Chassidim, all class leaders, all of them destined to go on Shlichus, you have been in the house what can you tell us? To be honest I was never able to put my finger on it, though Reb Zalman and Tzirel were certainly role models and completely given over to each child and each Mitzvah. I once heard a saying: to be born a mentch is an accident but to die as one is an accomplishment. To see Levi’s acceptance of hashems way to the bitter end, though painful, heartbreaking and shocking to me is still a reflection of the great upbringing that Levi experienced, though he certainly didn’t go without a fight or an all out war more like it. I recently spoke to Levi’s dear Aishes Chayil Miriam, and I agree completely with her sentiment, in addition to of course missing Levi, she misses Levi saying, it’ll be good, it’ll be good. She said, she somehow has the feeling that if Levi can send her a message now he would say, it’ll be good it’ll be good. I’m not sure how to interpret his passing, but everything else that came Levi’s way – he didn’t view it as a problem, more a like a challenge or a bump in the road as he would say often. It is now our turn to take all the lessons that we learned from Levi, the moments we enjoyed with Levi and do as he would undoubtedly wants us to do and let another Jew another person benefit from it. Levi oh Levi I thank you for the laughs, I thank you for the memories, I thank you for the hospitality that has been mentioned by so many others on this blog, and last but not least, I thank you for the inspiration! I can write all night until it turns light outside, but I’ll leave room on this blog for others to write. Will love you forever! Moshiach Now.